Fronting the Tasman Sea, the spectacular beaches surrounding the city of Sydney certainly add another dimension to any holiday in this part of New South Wales, with those of both Bondi and Manly being famous the world over. Bondi and the adjoining beaches share a lengthy underwater shark net during Australia's summer season, ensuring that swimmers and surfers are safe here. Located on North Steyne Road, the Manly Surf School is a good place to come if you are looking to hone your surfing skills, being founded in the early 1980s and now ranking as the state's best. Lying on the eastern side of Sydney, Coogee Beach is roughly 8 km / 5 miles away and boasts a rich Aboriginal heritage, with some Aborigines still living within the area nowadays. Many beaches around Sydney are manned by volunteer lifesavers, with the North Bondi Surf Lifesaving Club being especially historic and established way back in 1907. Adjoining picnic tables, BBQ areas, children's playgrounds, shops and seafood restaurants are a common sight along the principal stretches. Avalon Beach is famous for its glorious stretches of white and orange-coloured sand, as well as its spectacular views. With a large ocean swimming pool, children's activities and nearby cafés, Avalon often has strong rip tides and sizeable waves. Balmoral Beach is located on the Lower North Shore of the harbour and tends to attract sizeable numbers of sunbathers, especially at the weekend. Those coming to Balmoral will find an appealing harbour pool, frequent sailboat rental and waterfront restaurants, as well as an amphitheatre and a pavilion, where regular performances take place. 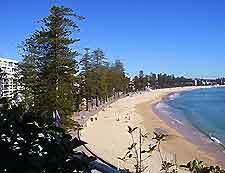 Bilgola can be found in the Northern Beaches area and is an appealing secluded, private expanse. Highlights include a huge ocean swimming pool and seasonal events. Bondi Beach, one of the region's most famous and spectacular areas, is a superb family orientated location. With promise of sun, sand and surf, Bondi is known throughout the world. Visitors should expect rough tides, ocean swimming pools and exceptionally warm water. Bondi is the most easily accessible stretch from the city centre and is just 8 km / 5 miles from central Sydney, residing within the eastern suburbs. Bronte Beach lies on the eastern side of the city, where it has excellent children's facilities, including a toy train. Other attractions at Bronte comprise a long seafront promenade, outdoor picnic tables, barbecues, and nearby shops, cafés and restaurants. Located in the eastern suburbs of the city, within a picturesque shallow lagoon area, Clovelly Beach is protected by breakwater from large swells. Popular with local snorkellers, scuba divers, swimmers and sunbathers, Clovelly is considered to be amongst the best places for swimming in the whole region. Chinaman's Beach resides in the harbour's Lower North Shore region, being an attractive and tranquil location, within easy reach of nearby Balmoral. Families with young children regularly visit this stretch, along with locals, who come here for its choice of themed water sports. 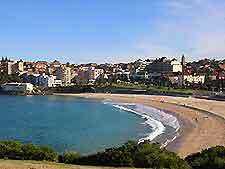 Coogee, in the eastern suburbs, ranks amongst the most popular holiday destinations in the area. With beautiful golden sand, excellent barbecue facilities, large expanses of green spaces for sports and outdoor sea baths, Coogee is close to many lively street cafés, restaurants and seaside hotels. Cronulla Beach, in the western Cronulla area, is an endless stretch of stunning sand, frequently filled with sunbathers and boasting strong waves ideal for surfing, as well as sand dunes and a number of swimming pools. Close to the Cronulla train station, this is considered to be one of the best beaches in the whole of Sydney and is regularly frequented by locals. Harbord can be found in the Northern Beaches neighbourhood, close to Manly. Popular with surfers and offering plenty of additional water sports, Harbord is often referred to as Freshwater. The Manly Beaches are home to some of the most popular coastal expanses around Sydney, including the likes of North Steyne, South Steyne, Shell Beach, Queenscliff and Fairy Bower. This long ocean peninsula features golden sand, calm waters, walking trails, scenic views, nearby shops, cafés and restaurants. Located in the Northern Beaches region, Mona Vale is well-known as a family spot and features a playground for children, barbecue facilities, a swimming pool and many traditional seaside activities. Newport Beach is one of the city's principal areas for yachting and is also popular with surfers. With a large ocean swimming pool, a playground for children and impressive stretches of sand, Newport has excellent amenities for families. 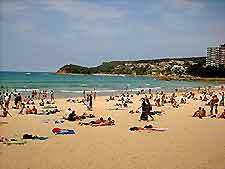 Palm Beach, in the Northern Beaches district, is a particularly noteworthy holiday destination. With glorious sweeps of sand and dunes, this stretch separates the Pacific from Pittwater. This spectacular peninsula is also home to some of the area's most luxurious and expensive houses. Parsley Bay is home to a scenic beach and is popular with families and children. Highlights include calm water and a large grassy area, which is perfect for picnics, sports and other outdoor activities. Situated on the splendid Manly scenic Walkway, Reef Beach is not a nudist spot, despite popular belief. 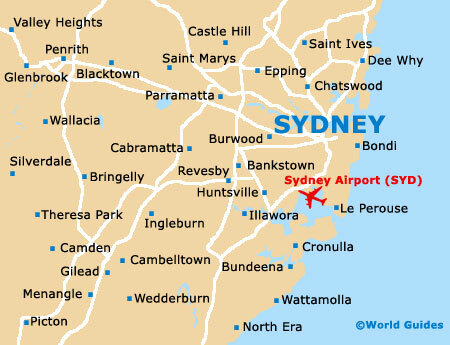 Nearby places of interest include the Sydney Harbour National Park and Dobroyd Head. Despite its name, Shark Beach is actually perfectly safe for swimming, as it has been netted. Located in the Nielsen Park area of Sydney, between Steel Point and Vaucluse Point, this spot is popular with holidaying families. The most popular of the Manly beaches, South Steyne is well-known for its extreme surfing conditions, large expanses of golden sand and nearby cafés. 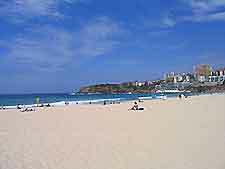 Tamarama Beach is to be found in the eastern suburbs of the city and is especially glamorous, being frequented by celebrities from time to time. 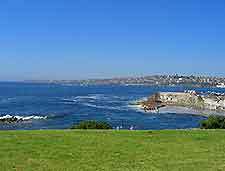 With golden sand, picnic areas and barbecue facilities, it is worth noting that Tamarama often has strong rip tides. Whale Beach lies within the Northern Beaches neighbourhood, where it is popular with families and features many activities for children of all ages. With a large swimming pool, picnic areas and calm waters, this spot can get busy during peak periods.